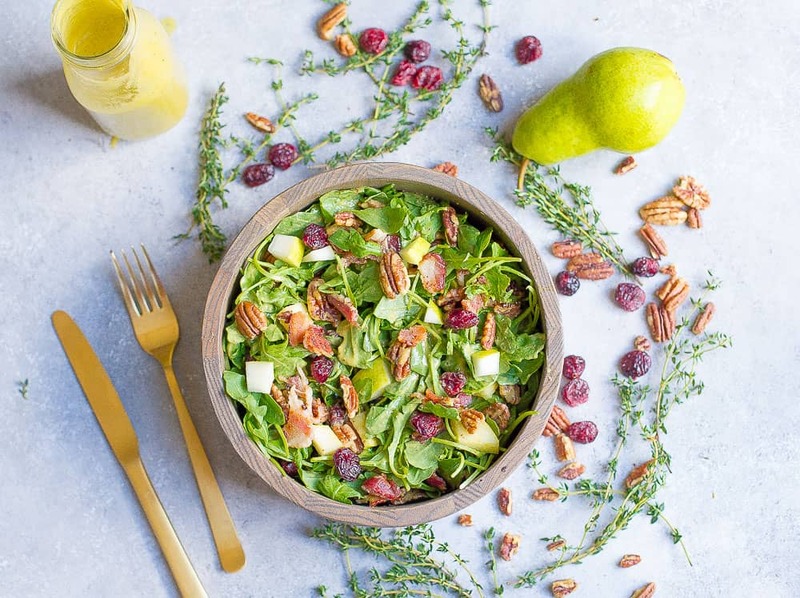 So many delicious fall flavors in this simple and tasty salad, dressed with a pumpkin vinaigrette! 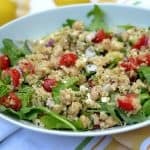 This makes a wonderful side dish, is perfect for a holiday gathering, and is sure to please a crowd! 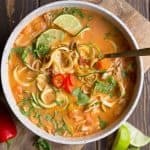 Paleo, and Whole30 friendly. It’s that time of year where I am experiencing “seasonal confusion”. The past 4-5 days have been nice and chilly in the mornings and the evenings, and then today I am back in a tank top and flip flops cranking up my AC. Part of me is completely ready to ditch summer, and jump right into warm sweaters, boots, and hot bowls of soup. Oh, and I want all the pumpkin. All. The. Time. The other part of me is still holding on to the last of summer, eating light and fresh salads, and firing up the grill every night. This is my idea of compromise. A delicious light salad for lunch, but dressed with the most amazing fall tasting pumpkin vinaigrette. 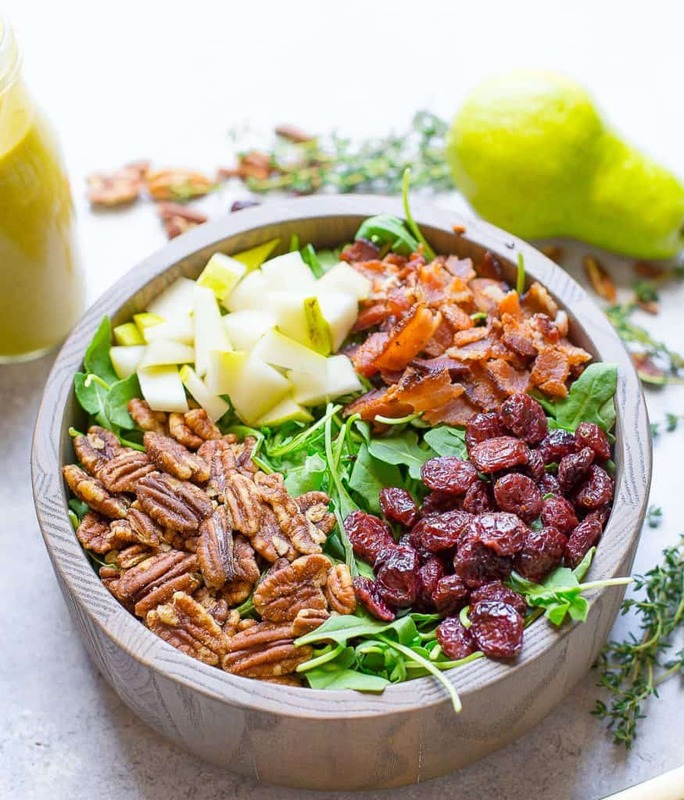 Diced pears, pecans, chopped bacon, and dried cranberries pair so well with this delicious vinaigrette. Can I just say that I am so glad we’re only half way through September. This creating pumpkin recipes in September only means that I can enjoy this salad for several more months!! Not that you can’t enjoy pumpkin in say, March, but that’s a little weird. I now have grand plans for this during the holidays, and most definitely will be a part of my Thanksgiving feast. 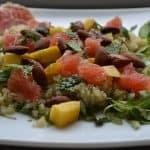 A few notes about this salad. 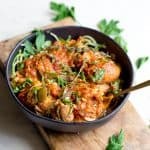 It is Whole30 compliant without the maple syrup (you can substitute 2 soaked dates), or if not following a strict Whole30, go ahead and use maple syrup in its place. 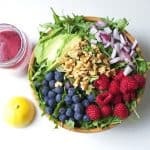 Also, slices of aged white cheddar would also be fabulous with this salad! Once again, not Whole30 or Paleo, so I kept that part out. I will add that when I make this for a crowd. Finally, the dressing makes ALOT. 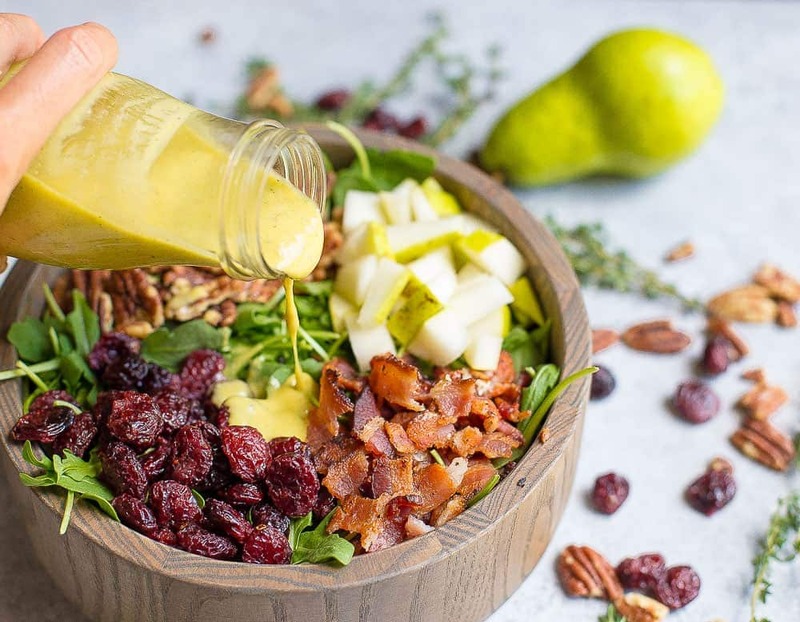 You will probably only use 1/2 – 3/4 of the dressing. Save the rest for another salad, you’re welcome! Begin by cooking your bacon over medium heat until desired crispiness on each side. Set aside, and drain fat with paper towel. Once cooled, chop the bacon. 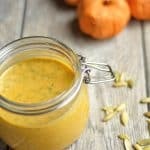 Now make your dressing: Place vinegar, pumpkin puree, basil, garlic, spices, salt, syrup or date, and pumpkin seeds (if using) in a blender or food processor. While motor is running, slowly add in oil. Check the consistency, if too thick, add in 1-2 tbsp of water. Now assemble your salad. 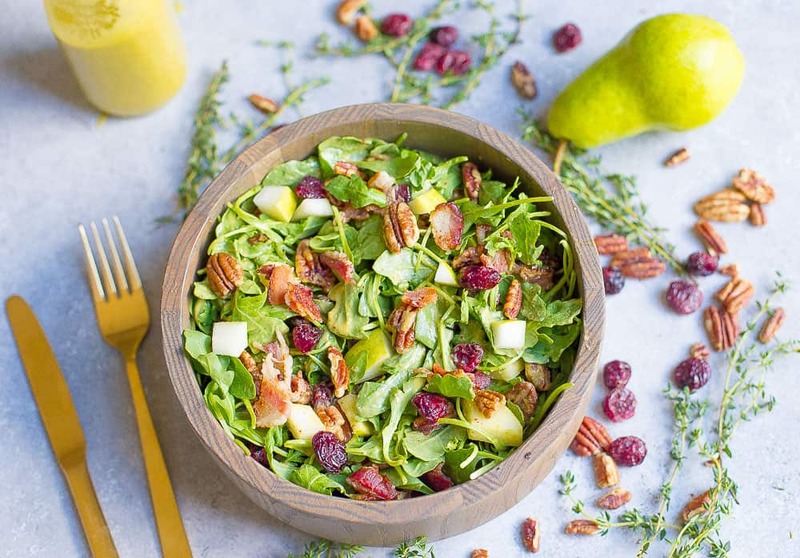 Toss arugula, pears, bacon, cranberries, and pecans. Add in about half of the dressing, and then adjust to add more dressing as needed. You will probably have extra dressing. 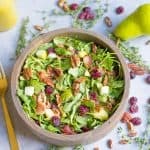 *You can omit the dried cranberries for a Whole30 option, or use an unsweetened dried fruit like raisins. **Soak the dates for about 10 minutes to soften. 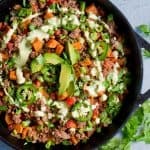 This is for a Whole30 compliant dressing. ***The pumpkin seeds create a thicker and crunchier texture, but are optional. You can also use a different nut in it's place! Good Afternoon. What kind of cranberries are you using? home-made unsweetened? we are trying to eat whole30 and can’t find sugar-free cranberries, could i maybe substitute with something else? I use unsweetened cranberries, but for Whole30, you can absolutely use something else! Raisins or any dried unsweetened fruit will work.